During the raw food diet at the beginning of 2015 I started feeling very unwell when eating mostly smoothies and salads. Even when I first started to experiment with raw foods I seemed to get very thirsty after eating large salads. A year ago I was suspecting that these problems had to do with eating too many raw, 'cold', foods, as suggested by my Chinese Doctor. However, my latest thinking is that I cannot tolerate large amounts of insoluble fiber, and since eating more and more fiber during the many raw food experiments, my body seems to have become even less able to tolerate it. 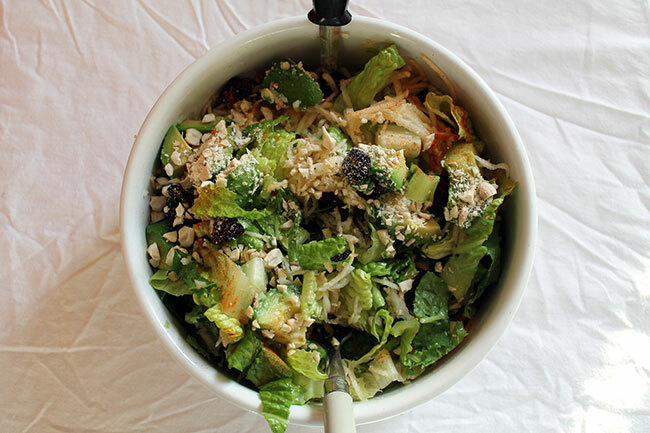 I haven't eaten many salads for a while and today I had a small salad, with shredded chinese cabbage, oven-roasted pumpkin and apple slices, linseeds, dried blueberry powder, black sesame seeds, coconut vinegar, soya sauce, salt, pepper, molasses sugar and olive oil. I was also snacking on rye crackers all day. Soon after eating the salad I got very tired and had to have a nap on the sofa at 8pm-ish. Then I began to have a 'blocked' kind of feeling in my chest/upper stomach, as if the food was sitting there, not being digested. Also, I had the feeling as if something was stuck in my throat. These sensations of indigestion continued until the next day, and the 'blocked' feeling slowly moved down from my throat and upper chest to the middle and lower stomach. This was also accompanied with the feeling of dehydration. The tiredness and the 'lump in throat' feeling are both familiar to me from last January's raw food diet experiment, at which point they seemed to get worse and worse, the longer I continued on the diet. I also began to get more fatigued on that diet and my muscles were not as strong as usual. This at the same time as I was also getting many benefits from eating so clean. In addition, after various dieting experiments I started developing a thirst and a dehydrated feeling, which seemed not to go away despite drinking many pints of water. I also got restless feet, flushing of the face, red eyes and extreme sensivity to dehydrating substances (sugar, caffeine and alcohol). Because some of the symptoms today were so similar, I now suspect that I have a problem digesting certain types of fiber. Or more correctly: my digestive system has a problem utilising and processing foods high in insoluble fiber (as strictly-speaking no human body can literally 'digest' insoluble fiber - therefore the name 'insoluble'). Not everyone develops problems after eating it, however. Insoluble-fiber-rich foods are: greens, green beans, corn, bell peppers, eggplant, celery, onions, leeks, garlic, cabbage, brussels sprouts, broccoli, cauliflower, nuts, seeds, skins of vegetables, wholegrains, etc. I have marked in 'bold' the ones that I have noticed at times having trouble digesting when eaten raw. Cooking seems to at least sometimes overcome these problems. Foods with soluble fiber I don't seem to have a problem with (except carrots, which I am intolerant to). Soluble fiber is found in: root vegetables, fruit, peas and beans. This problem hasn't always been as bad as now and I wonder whether the problems started because my raw food diets were too high in insoluble fiber. This finding explains many things: why I don't seem able to tolerate most bread, and seem to (these days) tolerate white bread better than brown; why raw food diets failed to increase my energy levels; why I couldn't tolerate brown rice cakes or brown pasta, whereas some white pasta seemed OK; why I often felt heavy, out of balance and/or very dehydrated after eating large salads; why I got very tired after eating raw corn chowder soup; and why I didn't feel well after drinking some store-bought smoothies but was able to tolerate juices fine. Just today I got confirmation that too much fiber can cause dehydration - which is a problem I developed somewhere along the way with my dieting experiments, and which became quite pronounced. Around 2009 when I first began to eat large raw salads for lunch - before any of my raw food experiments - I remember wondering why I felt extremely thirsty afterwards. I first thought there must have been plenty of salt in the salad, but a check with the health food store (where I bought the salads from) confirmed that there was none. Apparently fiber can swell up in your stomach, which can cause dehydration as it pulls water from your system. This, and other problems with fiber digestion are reported in the 'Fiber Menace' book, written by Konstantin Monastyrsky, whose summary I read on gutsense.org and find interesting. The writer of the book takes quite an extreme approach, suggesting that fiber is bad altogether - damaging the insides of our intestines. Apparently insoluble fiber swells up in the stomach, blocking digestion and causing bloatedness. He suggests that anyone suffering from intestinal problems - including diarrhea, gas, bloated abdomen, IBS, constipation, etc. - should eat less fiber. According to him, fiber can be used as a harsh laxative, and it will take time to gradually adjust to less fiber and have normal bowel movements. He is also of the unusual opinion that constipation is not caused by lack of fiber in the diet, but by lack of proper bacteria balance in the intestines (intestinal dysbiosis). Konstantin Monastyrsky also says that menstrual difficulties, including PMS, dysmenorrhea, back pain, cramping and Mittelschmerz (ovulation pain) are caused by pressure from the intestines on the reproductive organs, which are very sensitive during ovulation and menstruation. Too much fiber in the intestines cause undue pressure on the uterus, fallopian tubes and ovaries, according to Monastyrsky. Headache, when linked to the above problems, is the result of stress hormones, which get released due to pain and discomfort, he says. This explanation for menstrual difficulties could explain why my (severe) menstrual pain was repeatedly eliminated with juice fasting. It does not, however, explain why my menstrual pain was also eliminated/ greatly reduced during raw food diets. (See a more detailed account on different ways to eliminate menstrual pain here and here - both short- and long-term methods). On the other hand, a gynaecologist told someone I know that she should stop eating so much fiber, after feeling a blockage in her intestines. Although the 'Fiber Menace' summary article was an interesting read, I do believe that we need to eat fiber in moderation, mainly because most nutritionists, doctors and specialists agree that we do. I have personally found absolutely no problem eating soluble fiber, which Mr. Monastyrsky also recommends we eliminate from our diets. If we couldn't eat soluble fiber, fruit, beans and root vegetables would be out of the question. If we couldn't eat insoluble fiber, vegetables would be out also. The 'Fiber Menace' recommended diet therefore would seem to consist only of animal foods, liquids, refined foods and algae - not something I am willing to try or advocate. Even dedicated meat-eating proponents: paleolithic-dieters, Dr. Mercola and Dr. Lawrence Wilson, emphasise the importance of including some fibrous plant-based foods in the diet. Dr. Lawrence Wilson recommends eating nine portions of cooked vegetables per day, since cooking, according to him, makes the food easier to digest - presumably because it softens and opens up the fibers. Dr. Mercola and paleo proponents emphasise the importance of including raw foods in the diet. General recommendation for constipation is to eat more fiber, however, it may be worth experimenting with what types and quantities of fiber suit your digestive system, since there may be some truth to Konstantin Monastyrsky's theory as well. Eat nine cups of cooked vegetables each day (to get fiber). Drink about three litres of spring water or carbon-only filtered tap water per day (as dehydration causes constipation). Don't eat sugars, fruit, caffeine or alcohol as they are dehydrating. Learn how to slow down and relax (as stress can cause constipation). In addition, a good bacterial balance in the gut is crucial for proper digestion and elimination as well (see: dysbiosis). Read more about the causes of and remedies for constipation here. My experience proves to me that I can only digest raw, insoluble-fiber-rich-foods in limited quantity. Breaking the fiber down in a blender, cooking it, and drinking plenty of water may help with digesting fiber, but when it comes to salads and whole-grain foods I unfortunately have to limit them for now. As always, it seems to be a question of balance: Different amount of fiber is right for each person, their digestion and their body-type. Fiber is usually thought of as being important for hormone balance, proper bacteria balance in the gut, proper digestion, etc., but it does also seem to be more difficult to digest foods rich in insoluble fiber - at least for some people. So what does that mean for me? I am happy to have understood the reasons behind my symptoms: the 'lump' in the throat, the 'full' and 'stuck' feeling in the chest and stomach, the un-quenchable thirst after eating large salads. I will eat water-rich foods (soups, smoothies, fruit without skins), beans and other easy-to-digest foods; be careful with salads (monitor how I feel afterwards); drink juices of vegetables and greens; and avoid foods with hard fibers which I don't seem to tolerate well, such as kale, cabbage and dry whole-grains. In addition, probiotics, digestive enzymes, fermented foods and apple cider vinegar would probably be helpful in easing digestion. Another piece of the puzzle that is my health is falling in place. But as usual, I have many questions, most importantly: How to 'correct' this and is it an indication of a weakness/ or imbalance in my body or just a sign that I should eat less fiber for a while since I overdid it in the past? I also wonder if there is a raw food diet that would work for me in the long term? It sounds like it would have to be high in fruit, green juices perhaps, spirulina and perhaps some (limited amount) of nuts and seeds for protein... Would it have to be close to a fruitarian diet? I do worry about the small quantity of protein in fruitarian diets, as well as the weight loss experienced by many fruitarians. Time will tell, as I will definitely want to return to experimenting with raw foods quite soon. Note that the doctor later said that I might have IBS, even though I don't have many of the symptoms. My stomach bloats easily from certain foods, however, and she also thought the menstrual cramps might be due to IBS. It is known that people with IBS may not tolerate fiber very well. In my case I can tolerate it, just not in excessive quantities. "The IBS Navigator: The Standard for Irritable Bowel Syndrome (The Nutrition Navigator Books) (Volume 1)" by J. N. Stratbucker. This book claims to improve on the generic low-FODMAP recommendation for IBS by allowing you to figure out your specific sensitivities while continuing to eat as many foods as possible. It has full five star ratings on Amazon. "The Gut Health Protocol: A Nutritional Approach To Healing SIBO, Intestinal Candida, GERD, Gastritis, and other Gut Health Issues" by John Herron. Natural health remedies for constipation and menstrual cramps.